I can't believe it is the last week in October! This fall season has flown by and November is knocking on the door. The leaves have been spectacular, the weather has been amazing and the boys are so excited for Halloween! I love Halloween too. 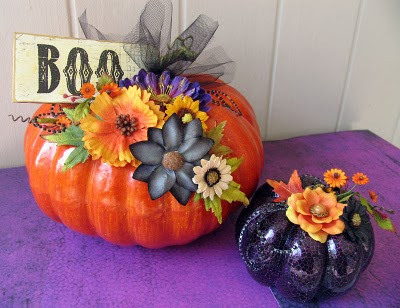 I am going to get some fun photos this weekend when we carve pumpkins, visit some friends and they get dressed up. Here is my final project for Ally Scraps, with pictures of Frank eating berries in the yard in her bare feet. Love her little pony tales too. :) I used October Afternoon papers, Sass A Frass Lass papers, die cuts, bling and my new edge punch! I love tying bows around my layouts and the buttons add the perfect final touch. 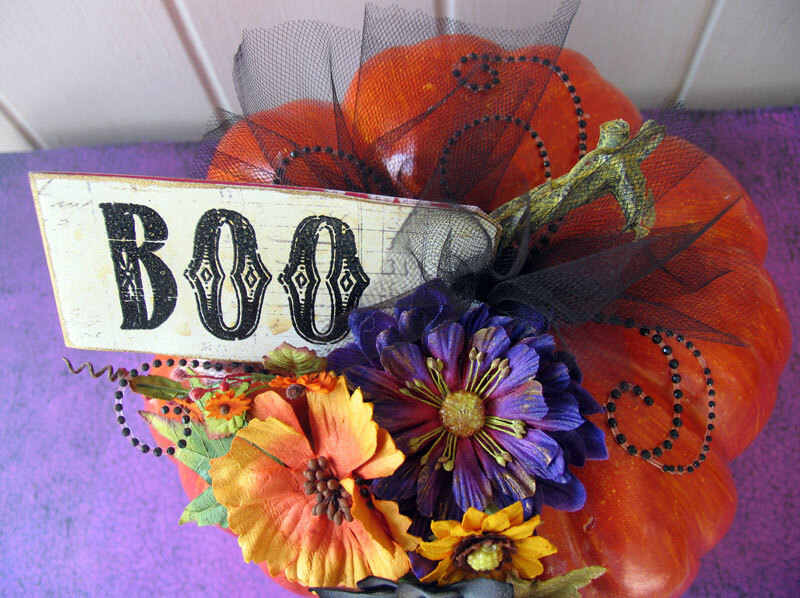 I slid the diecuts under the bow with silver gems on each flower petal. All of the paper edges are distressed and inked with vintage photo distress ink. I used Thickers for the title with sticker labels. I used a journal card from OA too. 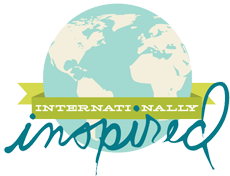 Ally Scraps is such a great online store with new products arriving all the time. And their shipping is super fast too! OK-back to work now! Be back soon with more to share! Hope everyone had a good week and the weekend holds lots of creative time for you. I did some shopping for the boys this week-they needed clothes! I am always amazed at how fast they grow out of things. Bryan is still a twig-so his waist is tiny but his legs keeps getting longer. And Jack is filling out everywhere! He is getting taller by the day but still hasn't reached his mama-ha! Oh and his long hair is gone again-no more surfer dude look-and he looks so much older all of the sudden...I am going to take a couple of pics this weekend. I was shopping at my local M's and found some cute pumpkins on sale. I knew they would look great with some Prima flowers and bling. I added the flowers using Fabri Tac, I tied some toulle around the stem and created a tag from left over paper. The word is stamped and embossed on the tag-I used Distress Emboss ink with black fine powder and heat set. Then I added gold powder to the edges and heat set that as well. I love the crackled look on the purple pumpkin-it looks so cool! I added just a bit of flowers and leaves, careful not to over power it with flowers because of it's size. To finish it off-I added black swirls around the top. I adhered them with a little extra glue to make sure it stays when packing it away. These look pretty cool on my buffet. 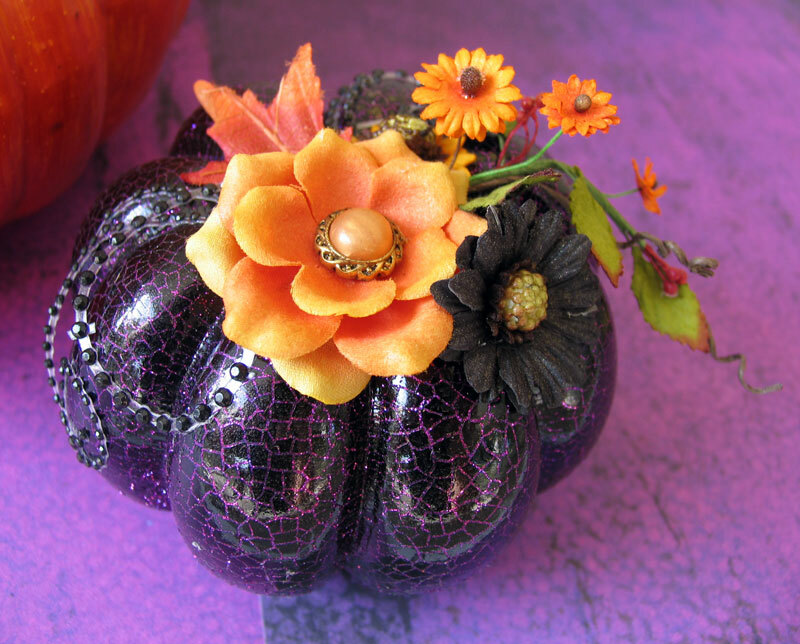 I love the pop of color added to my decor for the season-just like the orange leaves I am seeing outside right now. And this project was so easy to do! Thanks for stopping by! 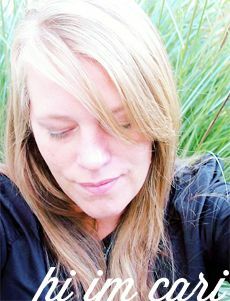 I have more projects to share including a layout I created for Ally Scraps...be back soon! 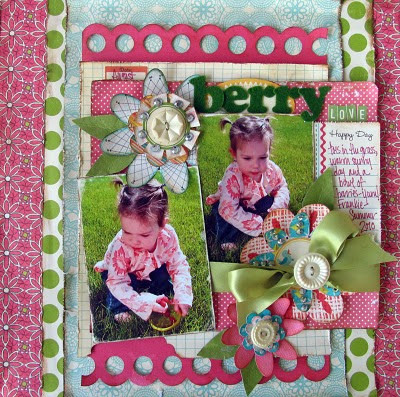 Another project for Ally Scraps and Live with Prima class! I have officially cleaned out my scrap space! I was a huge mess from a couple months of traveling, classes, and preparing projects for upcoming events. It feels so good to have it cleaned up and everything is put away in it's place. I went out and bought new baskets from Michaels that were 50% off to house my Glimmer Mist and paints. They are called Harvest baskets, but they are very simple and look perfect on my shelves. I will post pics later. It literally took a whole day... And now to clean the rest of my house...sigh. OK-onto more news! 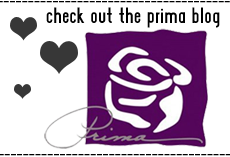 I am hosting a Live with Prima class Tuesday Night! YAY! I am going to make a Halloween banner using all kinds of Prima goodies, including lace, Little Boo papers and more. 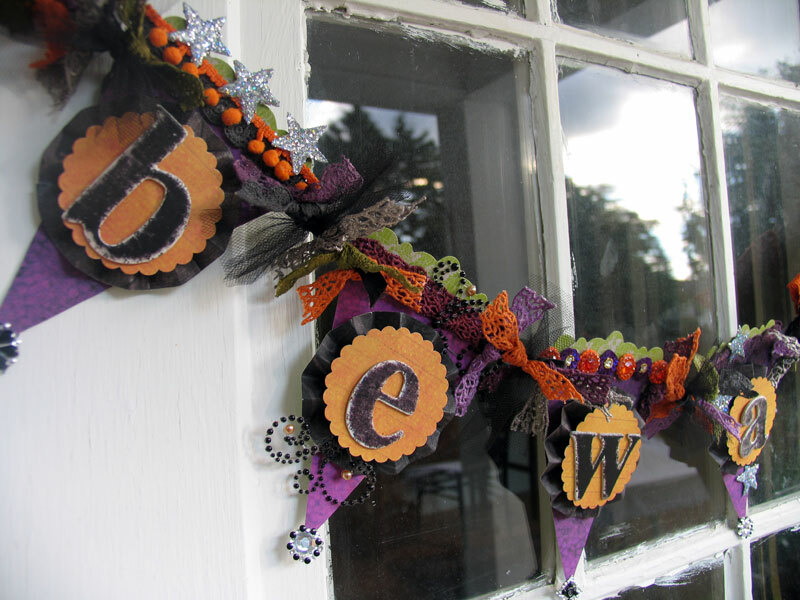 I have several techniques to share that I think everyone will like and I think this would be a nice addition to your Halloween decor...it's so fun to make and really easy too! The class is free and it airs at 6:30pm PST/9:30pm EST. Here is another project for Ally Scraps! This album has to be one of my favorites to date. I just went for it! I used October Afternoon Fly A Kite and Thrift Shop papers, mini book and journal cards. Ribbons, tags, pebbles and Kraft envelopes too. I painted the covers in Lettuce green using Adirondack acrylic paints by Ranger. 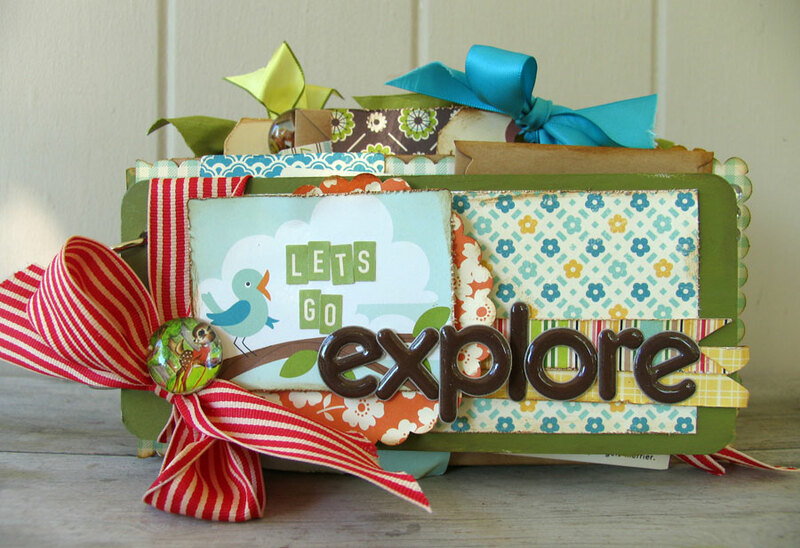 I layered paper, a journal card and a big ribbon on the cover. The ribbon is one of my very favorites by May Arts. They come in a variety of colors and I use them all the time. For the pages inside, I cut out large rectangles of various patterned papers and used a scallop punch around all of the paper edges. Then I created a pocket for each page by sewing the flash cards to the papers. I distressed the paper edges and inked them with Vintage photo Distress Ink by RAnger. I layered journal cards with Kraft envelopes and patterned papers. I also used the label stickers by OA for extra journal spots and titles. I tucked tags and journal cards into the page pockets throughout the album. 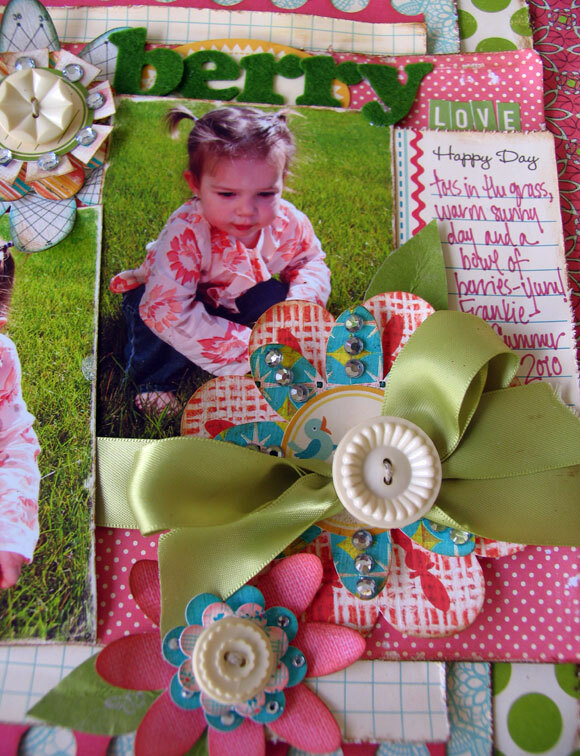 Simply add some ribbon pieces to the tops of the tags with little trinkets like page pebbles. The envelopes can be used for extra journaling or photos too. I love the vintage look of those journal cards-they are too sweet! I added some scalloped circles and ribbons to layer with them as well as buttons and bling. Now this little book is ready for photos and jouranling! I really love how it came together. Thanks for stopping by! I will have some fall treats coming your way.